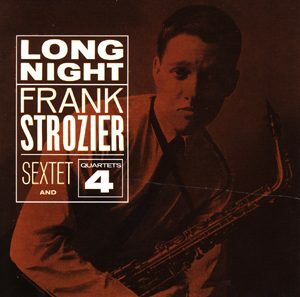 Influenced by both Charlie Parker and Lee Konitz, Strozier emerged in the late 1950s as the archetypal hard bop alto saxophonist. His playing was fluid, hard swinging and emotional and his solos beautifully constructed. Gifted with a recognizable sound and conception and an ability to constantly generate ideas without repeating himself, Strozier has always been held in high regard by musicians. Unfortunately, his contributions remain insufficiently known and appreciated by the wider jazz community. Born in in Memphis, TN (June 13, 1937), Strozier grew up among a wealth of talented young musicians from his home town including pianists Harold Mabern and Phineas Newborn, saxophonist George Coleman, trumpeter Booker Little and bassist Jamil Nasser (George Joyner). His first instrument was piano to which he would return much later in his career. It was in Chicago that he first gained attention as an alto saxophonist recording with a quintet known as the MJT+3 (Modern Jazz Two + 3) which included pianist Mabern, the outstanding but under-recognized trumpeter Willie Thomas, bassist Bob Cranshaw and drummer Walter Perkins. This unit recorded several LPs for the Vee Jay label which, in hindsight, reveal the ensemble to be one of the most innovative of the many hard bop working bands of the late 1950s. It was also during this period that Strozier first revealed his great talents as a composer. After moving to New York, all the members of the MJT+3 went their separate ways, beginning long and memorable careers. Strozier worked over the years with Roy Haynes, Miles Davis (briefly in a version of the great trumpeter’s band that also included George Coleman), Chet Baker and after relocating for a time to Los Angeles, drummer Shelly Manne. He also participated in many studio sessions on both coasts. Strozier continued to perform and record through the 1970s, often with the George Coleman Octet. But similar to the experiences of many musicians of his bent, he found jazz work becoming more and more difficult to rely upon. Finally, by the mid-1980s, his frustration with the scene combined with an inability to obtain high quality reeds led him to stop playing alto and return to the piano. On March 31, 1990, he made his piano debut in a trio setting at Weill Recital Hall in New York which was favorably reviewed by a critic in Cadence Magazine. But since then, little has been heard of Strozier who left music to become a teacher of math and/or science in schools in Westchester County, NY. I have some leads on 1960 radio broadcasts of the MJT+3 from Birdland but insufficient details to add these sessions to the discography as yet. Saxophonist Chris Byars has recorded a CD of Frank Strozier’s compositions: The Music of Frank Strozier. Please email me with any additions, corrections or comments. Many thanks to Thomas Aselmeyer, Kenny Berger, John Boija, Adam Brenner, Warren Chiasson, Michael Cuscuna, Bill Damm, David Demsey, Michael Fitzgerald, Howard Johnson, Ronald Lyles, Donald Nania, Muneer Nasser, Ned Otter, Dean Pratt, Johannes Probst, Stephen Roane, Rob Rosenblum, Jim Schapperoew, Bill Schweitzer, Todd Selbert, Bob Sunenblick, Barry Velleman and Michael Weil for providing information.